Capital of a small country, Luxembourg City is nevertheless a lively and bustling town. A real cultural platform, it abounds in venues for artistic expression, such as museums, theatres and concert halls. The centre of the country is also home to no less than 150 different nationalities that have chosen to live in a city at the heart of action. The cultural program that makes up Luxembourg is made in the image of its city dwellers: multilingual, multicultural, creative and eclectic. Nowhere else in Europe will you find such a discrete and dynamic mixture of ancient fortresses and contemporary architecture. 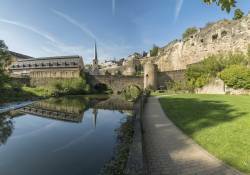 Moreover, the Old City of Luxembourg has long been part of the UNESCO World Heritage. High-tech buildings run alongside historic monuments reflecting a rich tapestry of urban experience. In short: Luxembourg is a modern city with deep roots. One third of the surface of the city of Luxembourg is covered with beautifully landscaped green spaces. The abundance of parks and gardens passing through the capital of Luxembourg makes a green belt where life is good. Discover Luxembourg’s unique sights, culture and history, during a tour of the city by tourist bus. Renowned for its banking center, one often forgets that the city of Luxembourg is also the headquarters of many European institutions. But furthermore, Luxembourg is an excellent platform for dynamic business activity that is heterogeneous but not limited to financial activities. Discover Luxembourg through the ages by traversing its architectural landscape from the historical city centre to its modern business centres. Surf as much as you want, without worrying about your data allowance with HOTCITY WiFi! "Stay and eat in the area"
Looking for a hotel in Luxembourg? Choose from a multitude of small family-run hotels and luxurious castles ideally located in the most beautiful regions of the country. Looking for a restaurant in Luxembourg? Follow the restaurant guide for Luxembourg and discover a unique gastronomic offer that is highly appetising.